SAN FRANCISCO (KGO) -- President Donald Trump critized Governor Jerry Brown over how California handles its water, as wildfires rage through parts of the state. 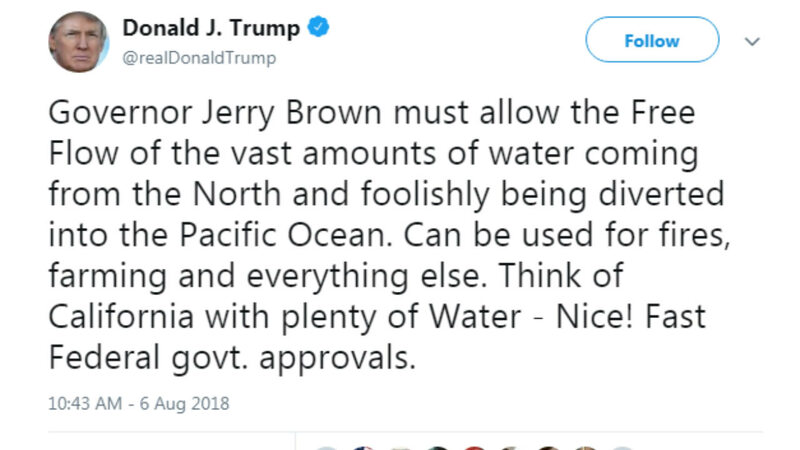 The president took aim at Brown on Twitter about fresh water being diverted into the Pacific Ocean. Trump urged Brown to use that water to fight wildfires and to let it flow to farms. Brown fired back saying the president's tweet "doesn't merit a response." Many Central Valley farmers and others have spent years fighting both federal and state elected leaders to get more water.